If you’ve ever used a hot pack to warm up a sore muscle before exercise or a sporting event, then you know that heat can increase blood flow and reduce muscle stiffness. Infrared heat is a form of energy that allows you to heat your body more effectively and penetrate more deeply than other types of heat. 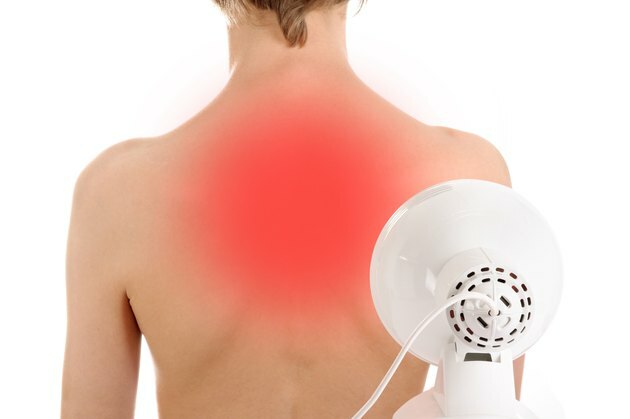 Infrared red heat can be utilized locally with an infrared light therapy device or more broadly with an infrared sauna. A 2009 paper by Dr. Richard Beever in the journal “Canadian Family Physician” reviewed research on infrared heat’s cardiovascular health benefits. Beever explains that five separate research studies indicate that the using infrared saunas can benefit those with coronary risk factors. The specific risk factors that benefited with infrared heat use included high cholesterol and hypertension. According to Beevers, one reason infrared heat may help cardiovascular health is the demand placed on your body to regulate the heat compares to the physical effort level of walking at a moderate pace. Infrared heat can also help you if you have a muscular injury. Increasing blood flow to you injured muscle helps increase healing. Physical therapist Tricia Trinque explains that in addition to heating deeper into your muscles, infrared heat also releases nitric oxide. Nitric oxide improves circulation and increases the oxygen and other nutrients coming to help heal the injured area. To treat a specific injury, such as a strained hamstring, with infrared heat a physical therapist would use an infrared light therapy device. Another benefit to infrared heat is that it helps wounds heal more quickly. Trinque explains that increasing circulation and nitric oxide levels in the area around the wound speeds up the healing process. This is especially beneficial to those who have a difficult time healing, such as diabetics. Do Infrared Saunas Work to Lose Weight? What Are the Benefits of Using the Whirlpool?